Your Friday prompt for Stream of Consciousness Saturday is: “-clo-.” Use a word or words that contain the three letters in order, and base your post on it/them. Enjoy! Pingback: Stream of Consciousness Sunday (well, at least it’s honest): The wrong stuff, part three… | Diary of an Internet Nobody. Pingback: Cloistered | Creative Writing or Bust! 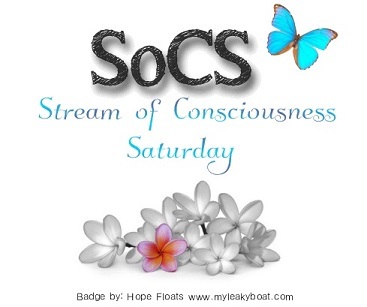 Pingback: SoCS — Clouds in my coffee | Forty, c'est Fantastique ! Pingback: Being Chased by Clowns | Anything is Possible! Looking forward to your photos Linda. Good weekend to you Linda.. Looking forward to seeing pictures from your trip! Also, Christmas? Already? I’m SO not ready.